Commuting to work or school has been boring and hectic until the introduction of the best commuter electric scooter. Well, an electric scooter for commuting offers a convenient and fun way to commute not to mention greatly reducing the carbon footprint. The best electric scooters for commuting are equipped with powerful motors that enable them to attain insane speeds for fast commutes.They also have long-lasting batteries that help them cover huge distances. Plus most of them are foldable and portable for easy storage and carrying. Check out our picks to end up with a desirable model. GOTRAX simply means powerful, adaptive, and bold. Well, that’s what this commuter electric scooter is all about. It has 8.5-inch pneumatic tires that are made for commuting. That said, the tires absorb shock to let you enjoy those bumpy city rides. It also has a portable design, which enables its frame to fold down and lock for easy transportation and storage. Moreover, its size is perfect; measuring 44 inches high by 41 inches long by 6 inches wide when in a riding mode. Ideally, the scooter weighs 31 pounds only, meaning you will not have a problem carrying it from one place to place. Despite the compact size, this electric scooter is very powerful, all thanks to its 250-watt motor. The motor generates enough power to enable the scooter to hit a top speed of 15.5MPH. The 36-Volt battery also contributes to the performance of this commuting device by allowing it to travel up to 12.5 miles on a full charge. 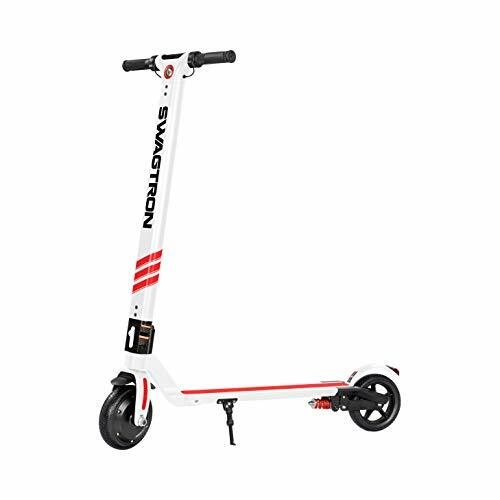 The SWAGTRON City Commuter Electric Scooter is another excellent unit you can consider if you want to make your commuting experiences fun. It has a 250-watt electric hub motor, which allows it to reach speeds up to eighteen miles-per-hour (29 kilometers-per-hour). The powerful motor also enables it to roll over 20-degree steep inclines. As if that’s not enough, this scooter has a Li-ion battery that recharges in just 3.5 hours and works up to 6 – 12 miles. It is a portable commuting machine that you can easily fold and quickly store in your car trunk, beneath subway seats, and closets. What’s more, it only weighs 27.5 pounds, meaning carrying it from one place to another will not be daunting. The lightweight construction, however, has nothing to do with its weight capacity, as the scooter can carry up to 320 pounds; thanks to the rugged aluminum frame. Although this scooter is costlier compared to a number of models on the market, it is worth it and we will prove why. It is equipped with an internal and external Li-ion battery, which enables it to gain a top speed of almost 19mph and move up to 28 miles. 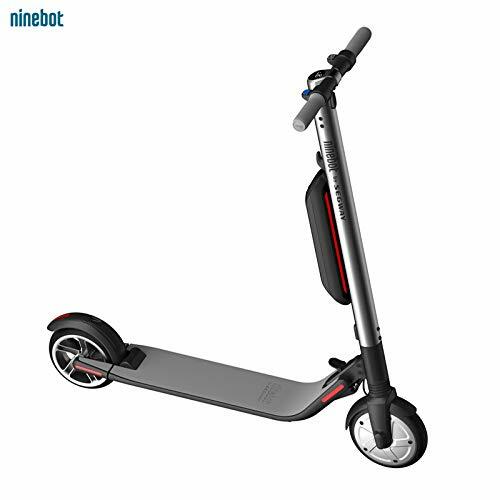 The scooter also has an LED display, cruise control, Bluetooth capabilities, customizable ambient light colors, and mobile app connectivity, which is for additional security and firmware updates. Well, this simply shows how technologically superior this scooter is. Another impressive feature of this unit is the anti-lock electric brake system that works with the ergonomically-engineered mechanical brake to improve your safety.We must admit that we are impressed by the 13’ braking distance when you are traveling at 12 miles-per-hour. Like the first two scooters on this list, this one can quickly be collapsed for easy, convenient storage. We recommend to you this commuter electric scooter because it comes with the button-activated cruise control. This feature has 3 riding modes that will allow you to find the most comfortable and convenient max throttle speed. The cruise control is activated by a simple press of a button. The scooter also has other impressive features like the efficient quick-charge battery that gets fully juiced in less than 3 hours. 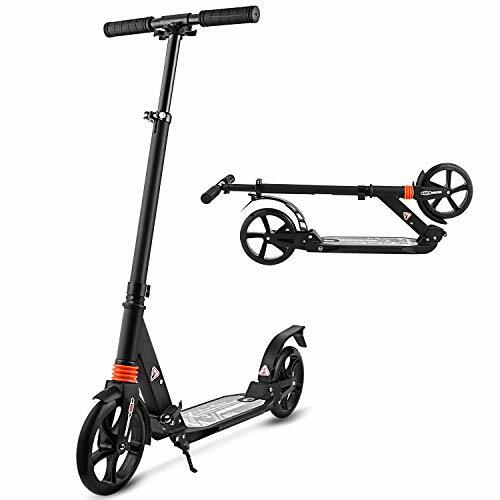 There is also a portable foldable design that combines with the lightweight construction to make it easy to carry the scooter when you are on the go. 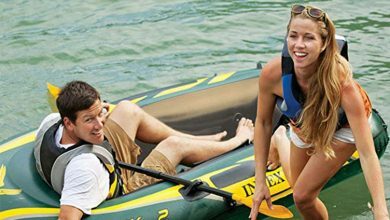 This model is built to cover serious grounds; hence, it is equipped with an efficient 250-watt motor that can conquer steep 25-degree inclines and reach unbelievable speeds up to 15.5 miles-per-hour. It is a long-range electric scooter that covers up to 14.2 miles when the battery is fully charged. We think that this commuter electric scooter will make a great purchase because it comes equipped with a gear shift setting. 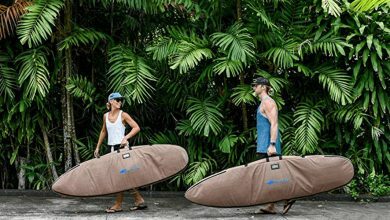 In the setting, there is gear one, which is for an 11 miles-per-hour comfortable ride as well as gear two, which is for a 15.5 miles-per-hour fast experience. The gear shift setting makes the scooter extremely fun to ride and even helps eliminate the boring commutes. Additionally, this electric scooter for commuting is equipped with 8.5-inch pneumatic tires that absorb shock to provide you with a smooth ride even on rough, bumpy terrains. 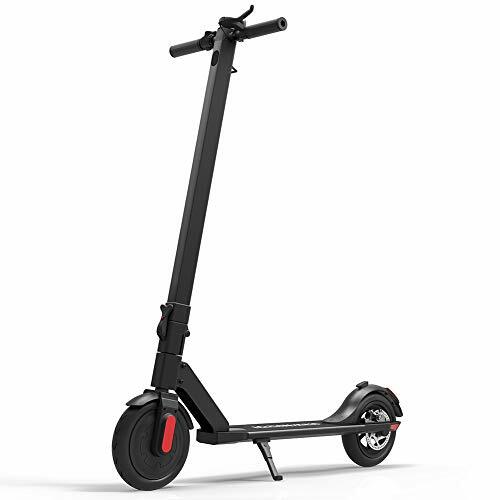 Plus it boasts a long-range 5.8Ah/36-Volt lithium battery that works with the powerful 250-watt motor to enable the scooter to reach speeds up to 15.5 miles-per-hour and travel up to 13 miles. When you are done using the scooter, take advantage of the portable folding design for easy carrying and storage. Provided you are weighing 264.5 pounds or less, this adult commuter electric scooter is for you. It is made of a high-density, durable aluminum alloy that greatly improves its weight capacity. Apart from adults, the scooter can be used by a child, considering that it is designed with safety and comfort in mind. Its safety is further proven by the German GS safety certification. Its design folds to make it very easy to store when it is not in use. 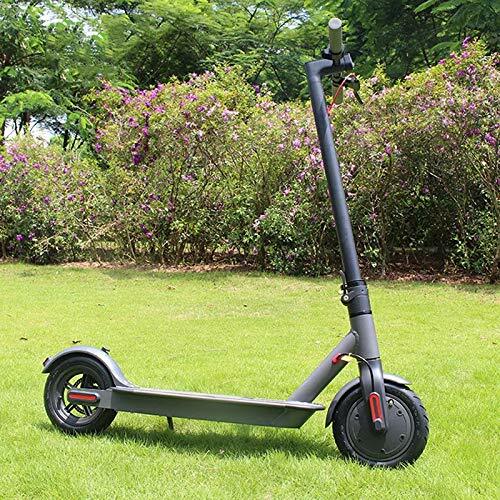 Moreover, the scooter boasts an adjustable height from 32.7 – 41.9 inches to suit people with varying heights. It also has a big front wheel that glides smoothly, thereby, giving you the much-needed comfortable, fun rides. The rear brakes will ensure that you always have the speed under control. Buy it as a gift for your child or a beloved member of the family. You do not need to surpass your budget in the name of getting a top quality commuter electric scooter. 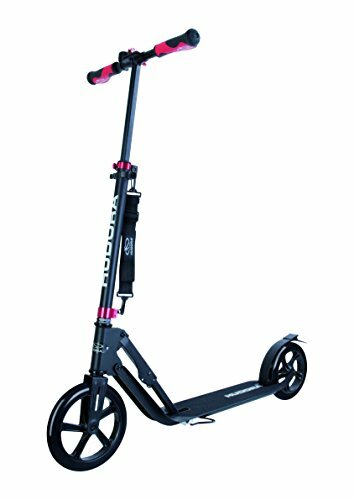 The Hikole Scooter for Adult Teens is within an affordable range yet it has everything that makes a scooter a top performer. It has an easy-folding-carrying mechanism that makes it super easy to fold in just 3 seconds. This means carrying it will not be a problem. 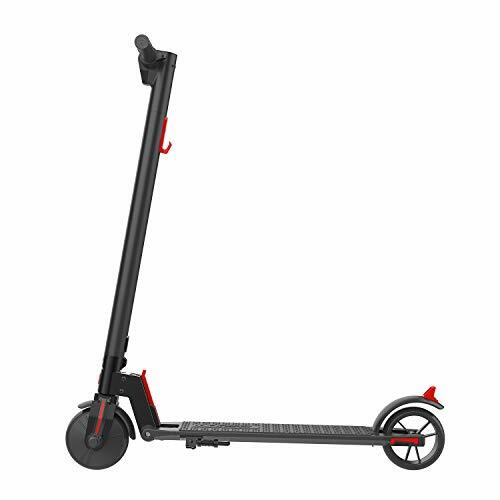 It is one convenient scooter model you can carry on the tube, bus or train and use anywhere. It comes equipped with fascinating features such as high durable 200-millimeter big wheels, precision ABEC-7 bearings, and Dual Suspension System. 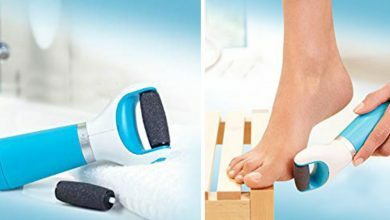 These features reduce vibration and help create an amazingly smooth glide. They make the scooter great for urban, city, and suburban pavements. 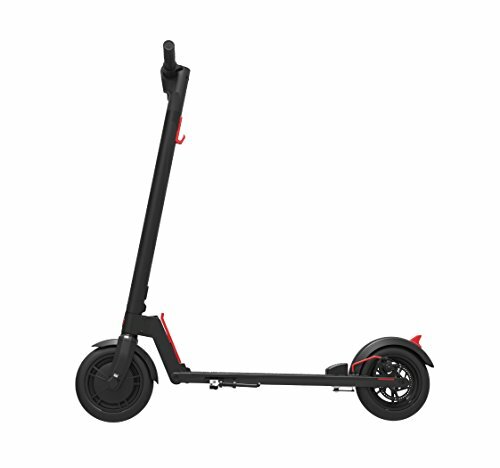 The scooter supports up to 220 pounds, and this is because of its high density and long-lasting aluminum alloy frame. Mile understands that for a commuter electric scooter to be ultra fast, it must have a powerful motor. And that’s exactly what they have done; they have equipped this intelligent electric scooter with a 250-watt motor. The motor is powerful yet silent, and it propels the scooter up to speeds of 15.5 miles-per-hour. The manufacturer also understands that the battery contributes greatly to the performance of an electric scooter for commuting. As such, they have equipped this one with a 7.8AH high-capacity battery, which can reach up to 18.6 miles, depending on the conditions. 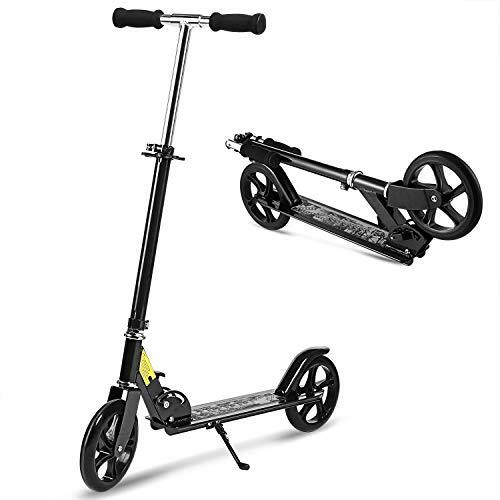 The frame of the scooter is very light yet incredibly sturdy, given that it is made of aerospace-grade aluminum. Because of the aerospace-grade aluminum construction, the scooter weighs just 26.9 pounds. The manufacturer assures of after-sale services to give you confidence in purchasing the unit. 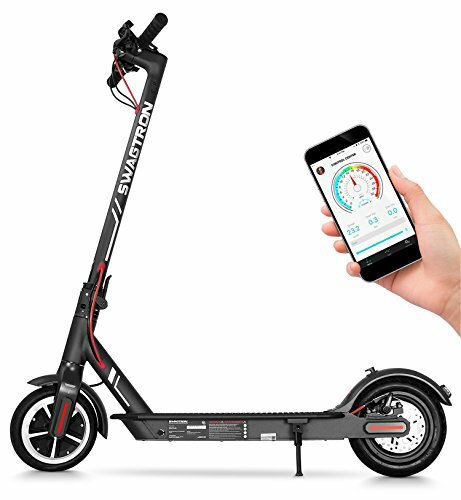 Intuitive, intelligent, and easy to use, this scooter is worth spending on. GOTRAX puts great effort in their work to provide you with stunning products. Having said that, expect this electric scooter for commuting to exceed your expectations. It has 2-speed settings that will let you use the first gear for a comfortable 10 miles-per-hour ride or use the second gear for full 16 miles-per-hour fun. Besides, the tires of this scooter seem adapted to any terrain. They are 8.5-inch rubber tires that can conquer any surface. The scooter also has a super bright LED headlight, which makes it safe to ride at night. The headlight improves visibility as well as grabbing the attention of other road users. You will know when it is time to recharge the scooter’s battery, given that the manufacturer has included 4-battery light indicators. Also, there is a lever-activated folding frame, which makes the scooter easy to use and very portable. This commuter electric scooter is designed for adults, teens, and kids aged not less than 8 years old. It has a 3-level telescoping handlebar that can be adjusted from 33.4 inches – 40.4 inches to ensure comfortable use. Its easy-folding-carrying mechanism enables it to fold in just 3 seconds, so you can have a frustration-free storage experience. It is designed with convenience and versatility in mind to meet your needs for city commuting. That being said, the scooter comes equipped with super large 200mm (8-inch) PU wheels that feature steel ABEC-7 bearing. It also has soft hand grips that significantly reduce vibrations in rough, plain, and bumpy roads. The weight capacity for this scooter is 220 pounds (100 kilograms). Ride it with peace of mind knowing that it is safe to use; thanks to the rear wheel fender braking system. To equip you with extra knowledge on how to find the best quality electric scooter, we bring to your attention the following factors. Your scooter should not put your safety on the line. Therefore, go for a model with a high functioning braking system. It is also important that your scooter meets the various reputable certifications for safety and quality. If you want your scooter to work well, go for a unit with a weight capacity higher than your personal weight. 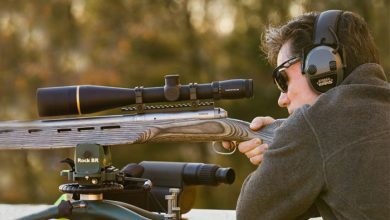 Ideally, make sure that it has a sturdy frame, as this greatly improves the weight capacity. These are two features that determine the performance of a commuter electric scooter. Therefore, make sure you get it right when it comes to choosing a scooter with a good motor and battery. With that in mind, go for a scooter with a powerful motor as well as long-lasting battery. Having an electric scooter that is portable is highly recommended. For this reason, look for a lightweight scooter with a foldable design for easy transportation and storage. The lightweight construction should, however, not affect the sturdiness of your scooter. Since you will be using your electric scooter to commute, it is advisable that you go for a unit with tires that absorb shock. Shock-absorbent tires help provide comfortable, smooth rides even on the bumpiest and roughest roads. How much does an electric scooter for commuting cost? Electric scooters are not as expensive as most people think. This, therefore, means there is something for everyone. What’s the highest speed an electric scooter can reach? This depends on how powerful the motor is. That being said, there are scooters that can reach up to 45mph. For safety reasons, do not operate a motorized scooter at speeds exceeding 20mph. Do I need a license to operate an e-scooter? To operate an e-scooter, you will need a driver’s license or a learner’s permit. License plates, registration or insurance are not required. Also, it is imperative that you wear a bicycle helmet when operating a motorized scooter. 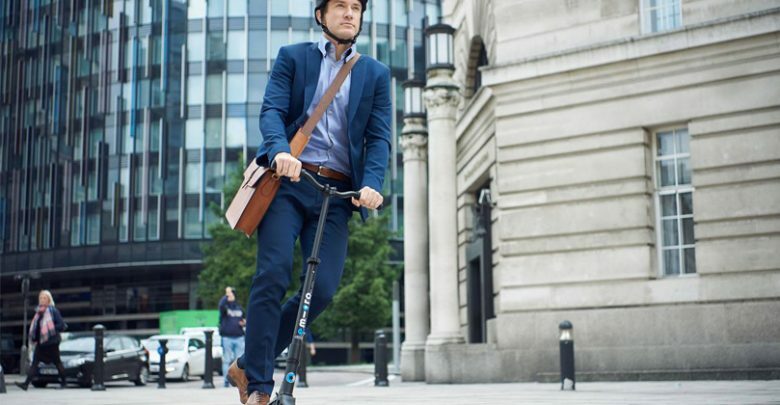 Getting stuck in the jam, arriving at your place of work late, and walking in an environment full of carbon dioxide fumes are just a few problems that can be put to the sword by an e-scooter for commuting. These commuting machines are fast, easy to operate, portable, and very convenient. So, waste no more time and get yours today!